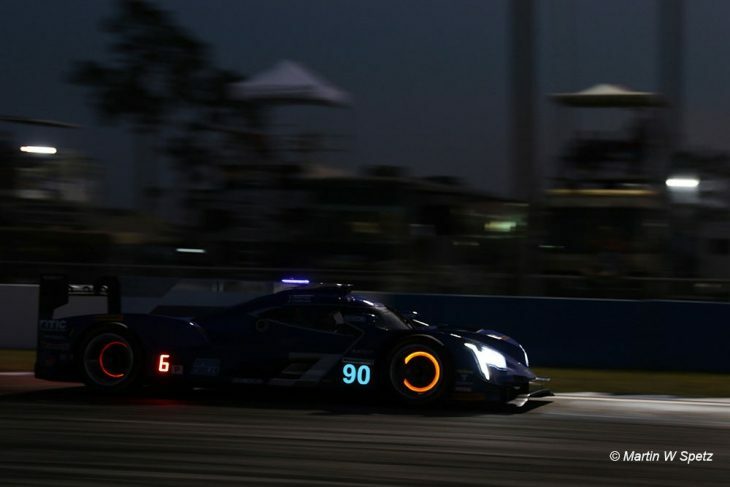 Into the final three hours of the 2018 12 Hours of Sebring and its still nip and tuck in all three classes, Prototype led by Jonathan Bomarito in the #55 Mazda but with Mike Conway (#31 Cadillac) and Nico Lapierre (#22 ESM Mazda) very much in touch. In the P2 field United Autosports are still leading the Pro-Am contenders, Alex Brundle is now aboard the #32 Ligier and runs 5th. GTLM sees Fred Mako with his #911 Porsche mirrors full of the #62 Risi Ferrari of James Calado. GTD has the top seven cars separated by 8 seconds Lawson Aschenbach leads in the #93 Acura from Madison Snow in the #48 Lambo. Bomarito’s latest routine stop puts him back into 4th, behind a charging Matt Mcmurry in the #90 Cadillac the top four separated by under 30 seconds. Half of the DPis have faltered, but despite that the P2s have not been able to challenge at all on pace, expect an editorial on DSC in the coming days on that front. The Conway/ Lapierre show continues, the pair tenths apart, and its the same story in GTLM between Makowiecki and Calado with Milner, Bruni and Auberlen locked together too in a thee car battle for third. Darkness was falling rapidly over the circuit but the massive crowd is going nowhere. Half a dozen Prototype cars can win this on pace, and every GTLM factory still has at least one chip in the game, albeit Ford have to push. GTD meanwhile is as open as ever. Bomarito caught, passed and pulled away from the #90 Cadillac in the first 20 minutes of the hour as Lapierre grabbed the lead up the inside of T17 and out-dragging the #31 into T1. Back in fifth Jordan Taylor was closing on Matt McMurry. GTLM was heating up too, Vilander now aboard the Risi Ferrari had grabbed the lead but only by a tenth, Patrick Pilet wanted it back, badly!For third it was an identical looking battle but this time the lead car was Auberlen’s BMW, and Earl Bamber’s Porsche was looking for any way he could to get by and work on the lead pair. 40 minutes into the 10th hour and Lapierre was flying, 40 seconds behind out of sequence leader Bomarito and into the 1:49s, Lapierre no pulling away from Conway with Taylor by now by McMurry but not making much of an impact on Conway. Stories of the race thus far are undoubtedly the double dnf for Penske’s Acuras and an astounding turnaround in form and pace for the Mazdas. Vilander and Pilet were still lapping tenths apart meanwhile. Bamber now through to third and eking out a meagre gap from Auberlen. Next stop for the leading Mazda saw Spencer Pigot climb aboard, he emerged third, right in front of fourth placed Jordan Taylor. Into the penultimate hour and Lapierre was holding a gap to Conway, both hauling in the United Ligier to put the #32 a lap down. Pigot meanwhile was doing a great job of dealing with the threat from Taylor in a close battle for third. GTLM was STILL Vilander and Pilet separated by tenths. GTD though was getting a bit of a shake up, Madison Snow still leading but behind there was jostling for position aplenty with Chris Mies the man on the move, up to third in the #29 Land Audi. 15 minutes into the penultimate hour and Tristan Vautier Has a huge shunt at T17, head on into the tyres and clearly out of the race, a tyre carcass rolling from the wreckage all the way beyond the start/finish line where it was hit initially by the #22 ESM Nissan, the DPi almost hitting the pit wall in avoidance and then later by the Turner BMW as the Safety Car intervened, eventually ending up at T1. Vautier had understeered off into the barrier, he was examined at the circuit medical centre and released. The HART NSX hit the debris at the incident site and pitted for examination after losing its splitter but quickly rejoined. Also with a problem under the Safety Car is the leading car, the #55 Mazda showing no headlamps, another car that has had substantial contact with debris through T17. Pit stops under the caution are done. 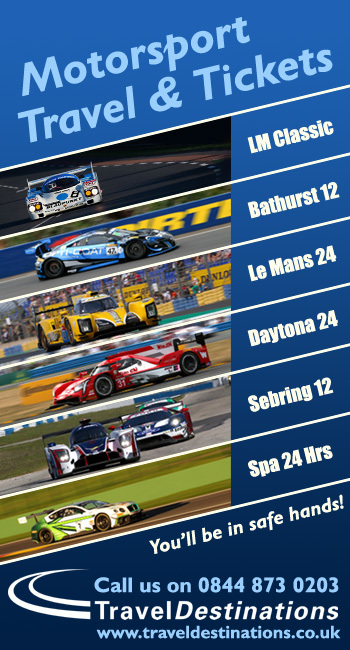 The order #31 (Nasr), #22 (Derani, #10 (van der Zande), #55 (Tincknell) with Paul di Resta fifth in the United Ligier. Bryan Sellers (#48 Lamborghini leads Chris Mies (#29 Audi) and Luca Stolz (#33 AMG) with Parente Jeanette and Mario Farnbacher, Jaminet and Jaeger close behind. As the race goes green 83 minutes left, Derani immediately pounces and lead in the #22 ESM Nissan. The race though goes back to Full Course Yellow in minutes as the already much delayed #66 Ford of Dirk Mueller is off track, and driver out of the car in the darkness. It would eventually make its way back to the pit lane. In the short time under green Alexander Sims made up two GTLM places to second behind Tandy. GTD meanwhile saw Farnbacher and Jaminet make their way by Jeannette, up to fifth and sixth. Green again, 73 minutes to go. Tincknell was the man on the move this time, up to third ahead of van der Zande, #55 Mazda ahead of #10 Caddy. Luca Stolz was up to second in GTD ahead of Chris Mies, and was right on the tail of the class leader. Next time around Vanthoor had got by Pier Guidi for third in GTLM, Jaminet by Parente for fourth in GTD. GTLM’s battling pack were at it again next time around, PIer Guidi getting third back from Vanthoor. With the retired #90 tumbling down the order Tandy’s GTLM leading Porsche is now into the top ten! Paul Di Resta meanwhile was doing a fine job of hanging onto Renger van der Zande, matching or even bettering the Cadillac’s times in a battle for fourth separated by under 4 seconds. And into the final hour!